New and gently used baby and maternity items are accepted at ALL of our pregnancy center locations. 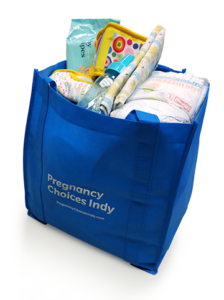 Please take large items and large loads of donations to our Downtown Pregnancy Center, located at 3266 N Meridian St, Suite 110, Indianapolis and call (317) 926-9176 before arriving. When you shop for baby items with Life Centers’ Amazon wish list you can have items shipped directly to our office instead of dropping off items yourself. A Baby Bundle is provided as a gift to our clients that choose life for their babies. A bundle contains diapers, wipes, baby clothes, a blanket, a bottle and many other items a new baby will need. An expectant mom comes to one of our centers to pick up a bundle when she is 8 months pregnant. Note: For safety reasons, we cannot accept donations of car seats or cribs.